Our newly redesigned search results page is now available for use by early adopters. Color pickers are in the Admin Center. You can customize each element on the page. Searchers now see Related Sites on all devices, and you can designate them in the Admin Center. You can customize the label for the Related Sites link. 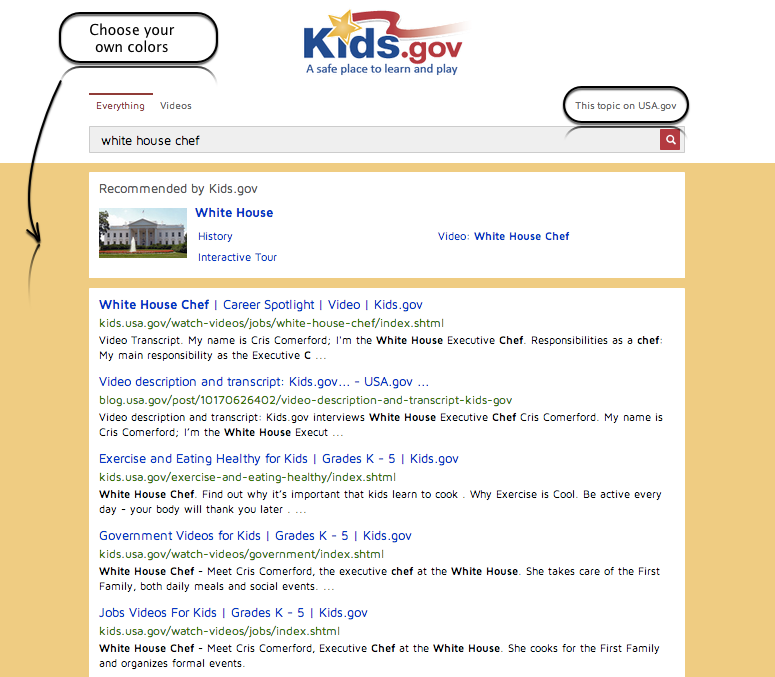 For example, Kids.gov has chosen the label, This topic on USA.gov. On the redesigned page, the header and footer links are viewable, with the header links appearing in an expandable “hamburger menu.” Additionally, Graphics Best Bets appear in two columns for a clearer user experience. Read the posts below to learn more about the redesign, why we did it, and how you can make the most of it. Searchers on Spanish sites now see Generado por … for attribution of the web results. Searchers no longer see a 400 error on sites that don’t specify a character set in their form code. Searchers now see the length of YouTube videos. Searchers that tab through the page now see an orange highlight around the active box to improve accessibility. We investigated the OpenSSL “Heartbleed” vulnerability. We upgraded to ElasticSearch 1.1.0 (External link) to gain some performance improvements. The full descriptions of Best Bets are now viewable on desktops. We improved our logic so that Domains with similar root characters can be added. We made several fixes to our results page to improve its accessibility. We now allow multiple Dublin Core values in RSS feeds. RSS-based news results published with a future date now display after their published date only.